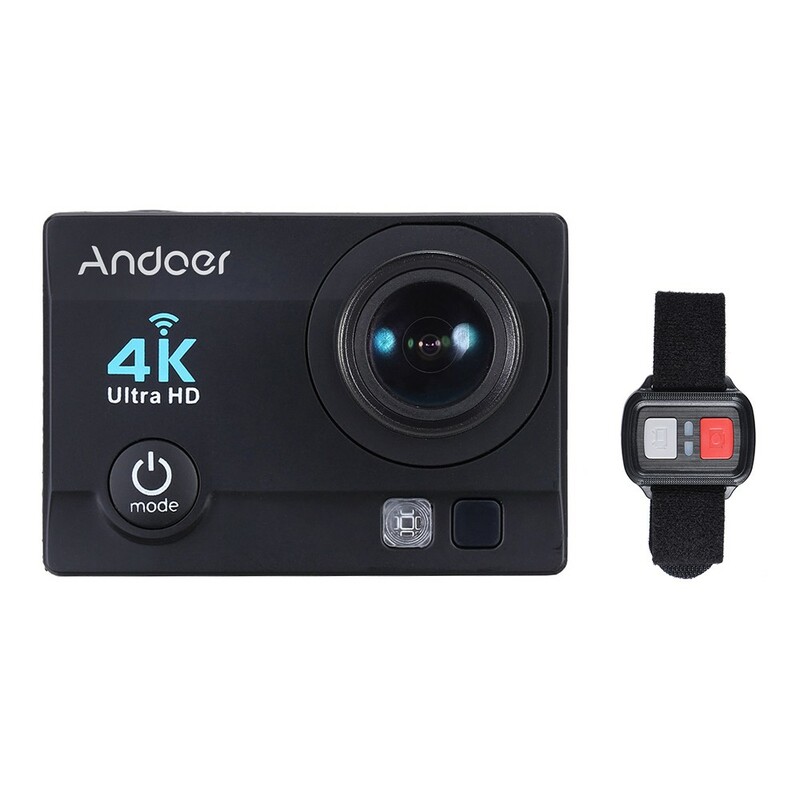 Andoer Q3H-R 4K WiFi action camera has the best performance in its class and is of a quite reasonable price. Max. 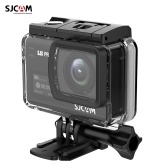 16MP, together with 170°wide-angle fish-eye lens produce excellent video/image. 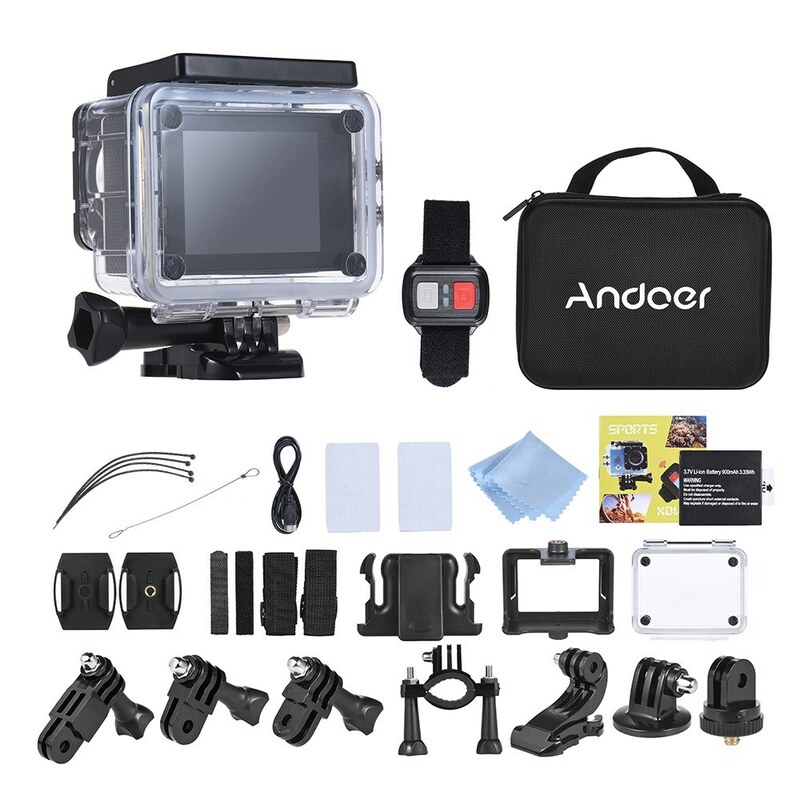 It has a remote control + built-in WiFi + waterproof 30m housing + portable carrying case, which is definitely a nice choice for your outdoor activities. 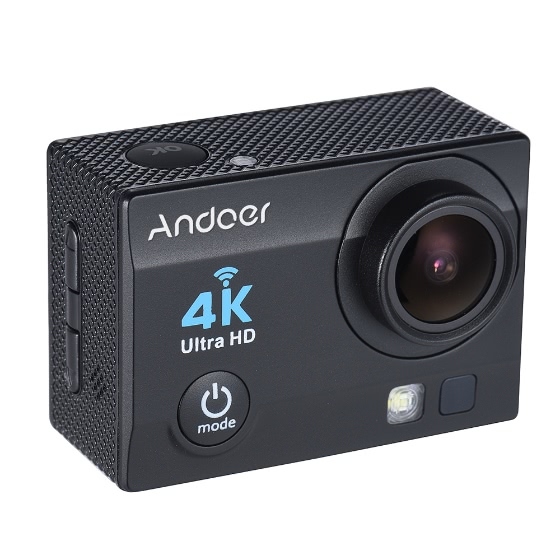 Support 4K 30fps, 2.7K 30fps, 1080P 60fps full HD video recording, support 180° vertical image rotation. Max. 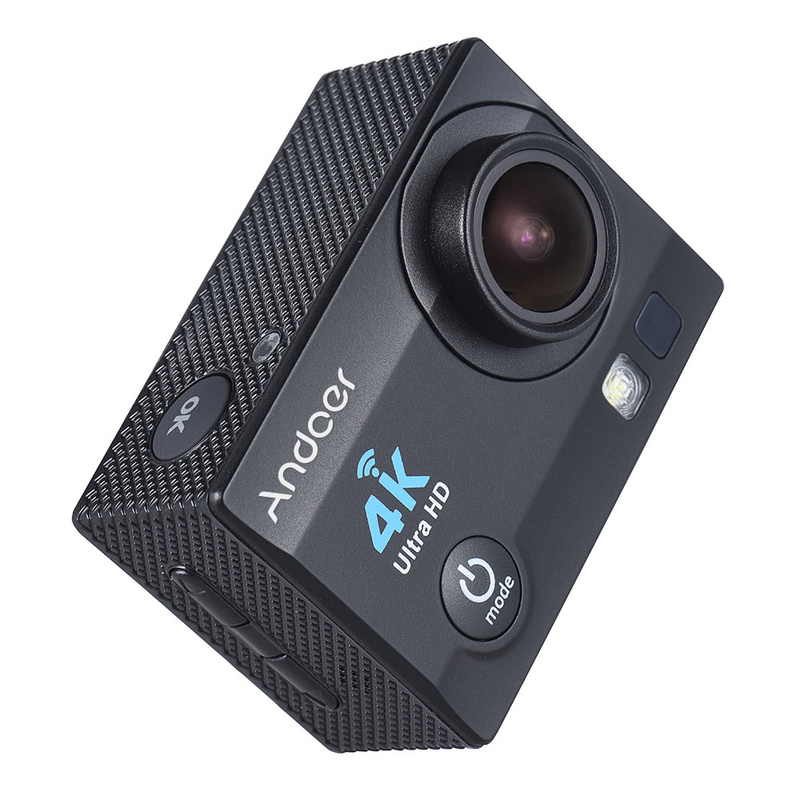 16MP photography resolution, with 170° wide-angle fish-eye lens and 2" HD LCD screen. 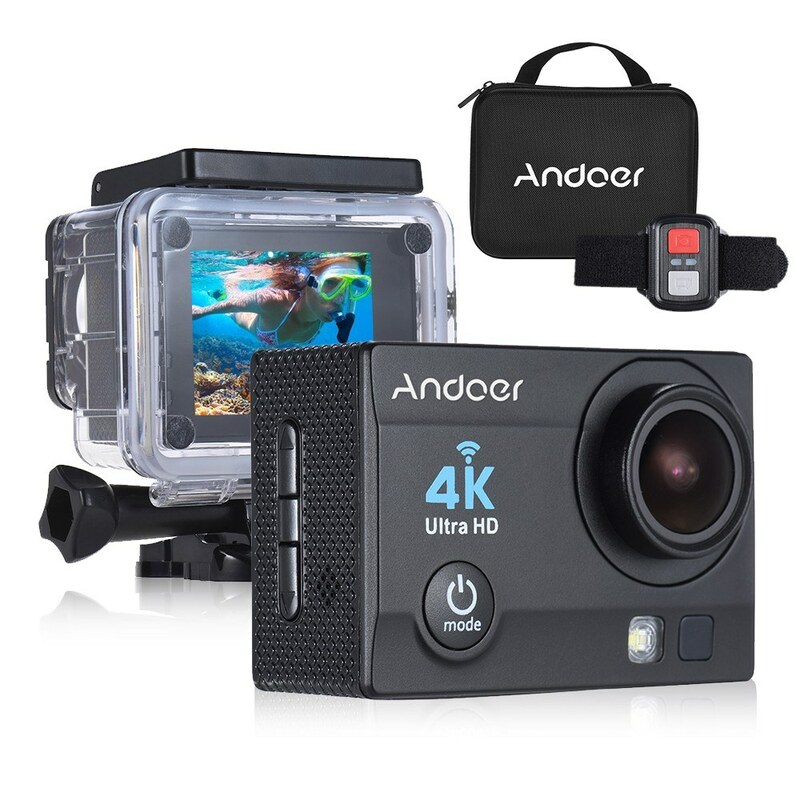 With Time Lapse/ Loop Recording/ Slow Motion video modes and Timed/ Auto/ Drama photo modes for more fun. Shoot from remote via the remote control, effective distance 10m/32.8ft. Support WiFi wireless connection with mobile phone (for Android iOS) for real-time share. With LED light, can be supplement lamp and SOS light. Battery life around 90min(1080P), detachable, easy to replace and prolong camera life. Packed in a portable carrying case, with various mounting accessories, convenient for your outdoor activities. 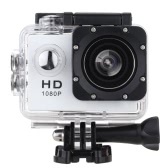 Applications: extreme sports, outdoor sport, bicycle, car DVR, diving, home security etc. Item size: 5.7 * 4 * 2.5cm / 2.2 * 1.6 * 1.0"
Package size: 21 * 16.5 * 6cm / 8.3 * 6.5 * 2.4"
The charger adapter is not included. Memory card is not included and class 10 or above is highly recommended to ensure working smoothness. A Https://www.tomtop.com/p-d2390.html This is the battery link We did not sell the charger. You can put the battery into the camera and charge the camera via the USB cable. Q Is the remote control waterproof? Q Does the loop recording support 4k at 30fps? Q Can I buy an extra battery for this camera? 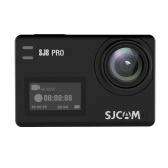 Q How work the &quot;driving mode&quot; in this camera? Q Is it equipped with Anti-Shake/Gyroscope..
Q can i connect external mic ? 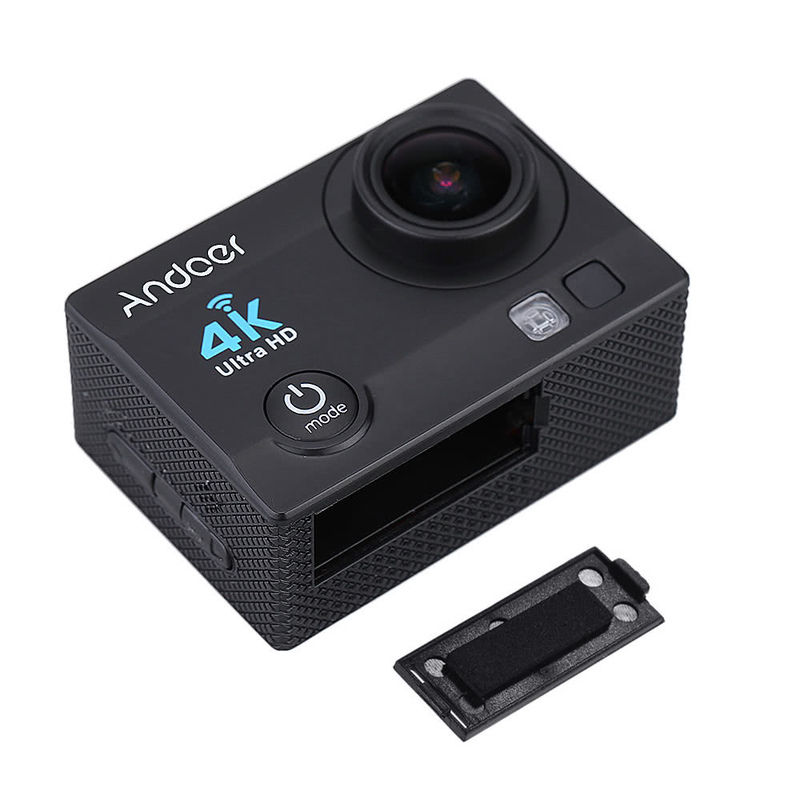 Q Hello, I would like to buy this camera and I want to know if it can be used as a fpv camera in a drone, so if it has an fpv mode in firmware? A Yes，flash is in the camara，you can find the LED from the picture，and you can open the LED in the set. Cheap, decent quality, includes sound. Best camera for this price hands down. The video quality is great, easy to use, happy customer! Good ! I like it. Thankyou . 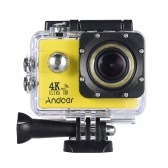 I can recommend to anyone who wants a good quality and cheap action camera. The video quality is acceptable for home use, at least as good as a mobile phone or maybe better, and has a really wide angel. You get lots of accessories and also a bag. The 1080/60 video resolution needs 3,3 GB storage / 15 minutes, so a 64 GB SD card can store about 4,5 hours video.The video smooth if you are in moving and there is not enough light (evening), but gets sharp if there is something stable on the image or there is enough light.You can buy extra batteries and separated charger for extend usage. - Excelente compra! O produto chegou em perfeitas condições. Certamente farei mais compras, obrigado TomTop. # Great purchase! The product arrived in perfect conditions. I will certainly do more shopping, thank you TomTop. Fast shipping, great communikation, super Product Quality! All perfectly! I recommend! 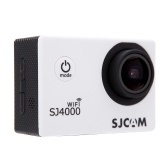 Very good camera, all functions work, I checked. Rich equipment. His money works 200%! Respectable. TOMTOP team, the room I ordered has arrived today 31/8/2017. Well packaged item is perfectly functional. I am very pleased with your organization and will definitely make further purchases in the future. Meanwhile I greet you cordially. Lorenzo. Very good the shipping time only takes about 19 days to arrive at my address, so the packaging is correct only missing a charging accessory in the package for everything else I recommend price and speed.As for the quality of the image I give of qualification a 8 as well as the manuals lack that they come in more languages like the Spanish and greater description of step by step of the producto.en conclusion I recommend this camara 4k ANDOER.